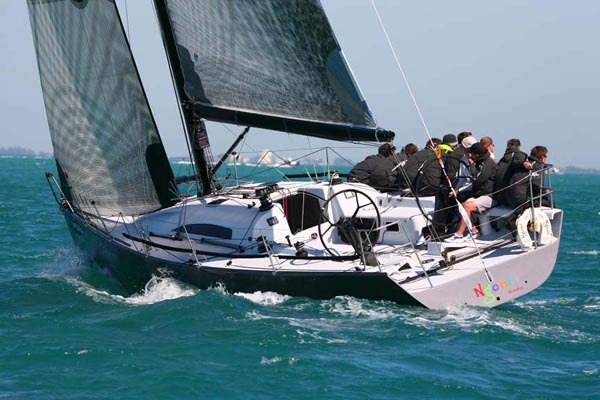 40′ IRC Cruiser/Racer with looks and accommodation and straight-bullet speed. 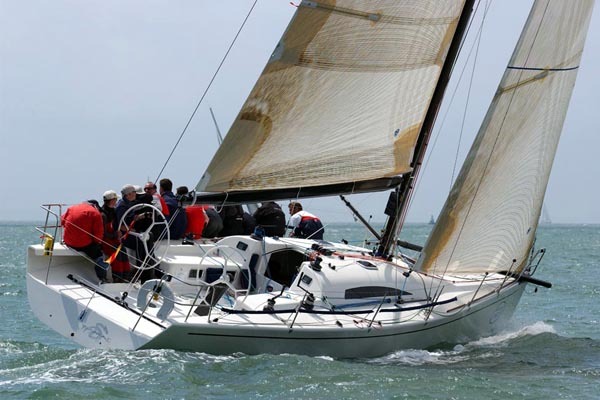 Tiamat, now Ngoni, was a 40′ IRC Cruiser / Racer design for Tim Costello of Dublin. 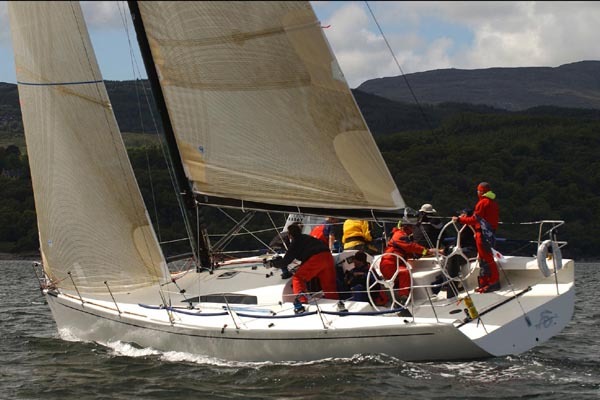 A week after her launch she won the 2005 Bell Lawrie Scottish Series both in Class and Overall, triumphing in a series with a huge range of weather conditions. 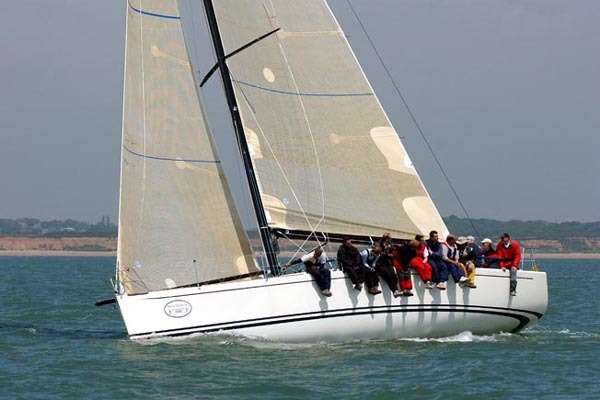 This success was matched by her win later that year in a 40 boat Cowes Week class with a day to spare, while the next season she was overall UK National Champion with staright firsts. 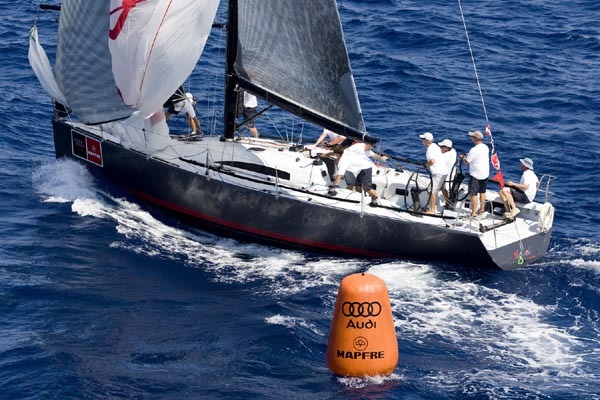 Her ultimate sale and reappearance as the exceptionally successful Ngoni, dominating 2008/09 IRC events in the Med proves what an evergreen performer she is. Built by Vision Yachts and named after a Babylonian dragon goddess she was designed for a client whose racing ambitions are underpinned by a genuine desire for a dual purpose design. 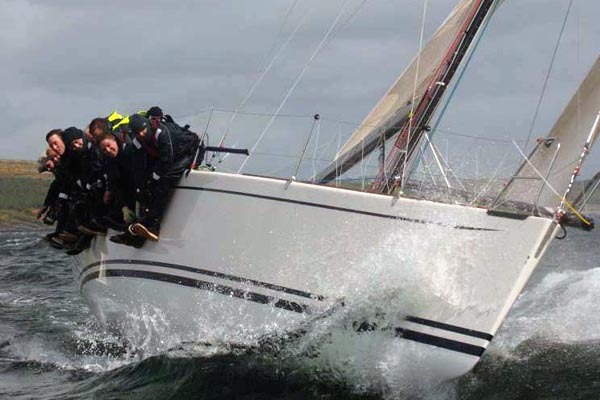 He enjoys racing in major events inshore and offshore, as well as Thursday night racing with friends, and occasionally takes the family for a leisurely coastal cruise. 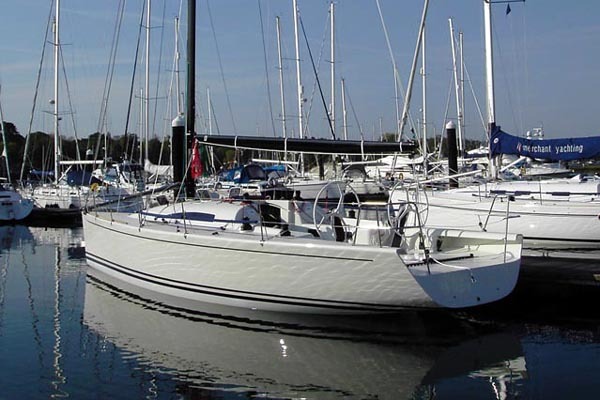 The 3 cabin interior provides a lot of accommodation, with full galley and nav facilities and a fully enclosed head. This mix of use is similar to our standout 2002 DK 46 design, combining real performance with a genuine interior with three double cabins, enclosed head, and comfortable saloon complete with removable drop leaf table capable of being erected in the cockpit. The clients background in electronics has placed a focus on the nav area in particular, with a hinged flat panel screen from which he can monitor the instruments, or swing it forwards to become a TV screen for the saloon. On deck the dual-purpose theme continues with coamings and seats framing a comfortable central cockpit space and 6 hatches in the coachroof, but twin wheels and cutaway sidedecks aft emphasizing the boats performance ambitions. Neat detailing from Vision on features such as the under deck mainsheet, through–transom backstay to an internal ram, and curved main hatch contributes to the refined feel of the deck layout, and reflects the excellent collaborative relationship between owner, designer, engineer and builders. Full modelling of the structure by engineer John Fox of FCS in the US has made producing quality drawings for experienced race boat builders Jonathan Howe and Chris Symons at Vision straightforward, as well allowing accurate predictions of as-built component weights, and in-house FEA of parts. Construction is e-glass and epoxy over corecell, with a SG iron fin and lead T bulb. Visions’ experience and commitment to building a true performance Racer/Cruiser using well thought out in-house techniques paid dividends in time and build quality, such as installing much of the interior components in the hull while still upside down on the plug to maintain accurate hull geometry. 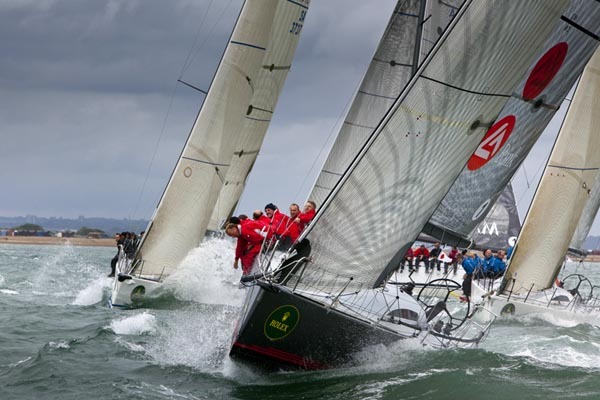 The swept spreader carbon mast from Formula Spars shares some dimensions with a Farr 40 rig allowing the owner to benefit from sail design developments in that class, and to pick up existing sails for a practice suit to protect the North 3DL race inventory. 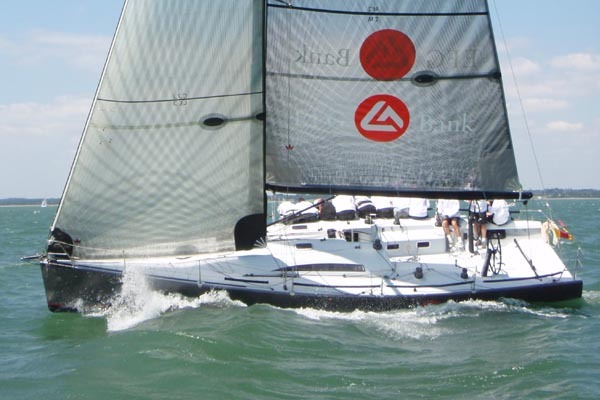 Some of the constraints imposed by this type of project have required fresh solutions from Harken and their UK custom agents Diverse Yacht Systems, some of the new features on show include push-button 12v hydraulics replacing manual panels, and a ‘magic wheel’ traveller control system from Diverse Yachts. With such active support from all the suppliers Tiamat is attractive and effective in equal measure, being a great opportunity to try alternative solutions prior to their introduction on production designs. The numbers for Tiamat reflect her cruiser/racer ambitions, the sail area/displacement and displacement/length numbers keep her just on the performance side of the middle ground that IRC promotes at medium and smaller sizes, embracing the bulk of production and dual purpose designs.